Smith Heating & Cooling is proud to serve the Ashland community! About Ashland, MO - Happy to be your hometown Heating & Air Conditioning Contractor! 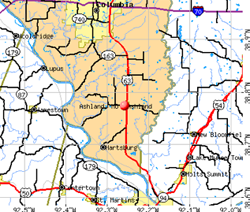 Ashland is a small city located in Boone County, MO, and according to the 2010 census, the population was 3,707. The population had risen substantially from the 1,869 residents counted by the census in 2000.This city was named after Henry Clay, a Kentucky congressman that was pivotal in the creation of Missouri as the 24th state through the Missouri Compromise of 1820. Seasons fluctuate greatly in the city of Ashland, and winter months see temperatures below freezing, while summer months are typically warm. Due to the small size of Ashland, most of its attractions are found in nearby Columbia. Columbia is home to the Missouri Theatre Center for the Arts and the Jesse Auditorium. Museum enthusiasts may enjoy the Museum of Art and Archaeology, while nature lovers will likely appreciate a trip to Rock Bridge Memorial State Park. Ragtag Cinema and The Blue Note are other popular destinations.